As I sat in my van, looking out at the full moon from my campground in the Grand Tetons, a sense of bliss washed over me. It was the vernal equinox and I’d had an amazing day. I woke in my campground to just a nip of Fall in the air. My dog and I hiked all around as the aspens glowed in the September light. With just a hint of snow on the grand peaks up ahead, most of the tourists were gone and we’d had some beautiful trails to ourselves. I had dinner at the Jenny Lake Lodge and chatted with a couple from North Carolina about our RV adventures. 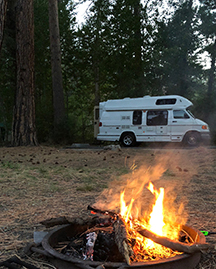 That was day 12 of my 36-day solo van adventure. A trip like this had been a dream of mine for some time, and I always imagined I’d do it with a partner. But the cards had lined up differently. I just received a 6-week sabbatical from my job and small bit of money from my Dad’s passing—and no girlfriend in sight. The time was now. I found an amazing van on Craigslist, a 1999 American Cruiser in excellent condition with only 75K miles. I named her Squeaky and took her on a few test weekend runs before setting out. As much as I wanted to do this, I was also anxious. As my departure date grew closer, my fears started to take over. What if the van breaks down? Will it make it over mountain passages? Will I be able to back it into tight RV camp spots? How will my dog be if I have to leave her in the van for extended periods of time? Rattlesnakes, bears, forest fires—so many things to worry about! Despite the fear—in fact because of it–I knew I needed to do this. I wanted to challenge myself. I wanted to face the fears to see what might be on the other side. I set out September 10. I left around noon with a planned camping site about four hours away. Full tank of gas, new road atlas, dog in her new seatbelt, a stocked kitchen and a full tank of gas. My good pal stopped by to see me off and with GPS directions in hand I was off! 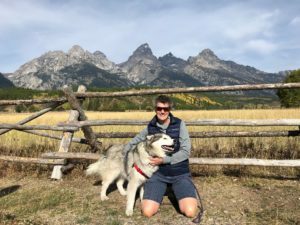 My planned route was to start driving East from my home in Portland and visit Glacier, Yellowstone, the Grand Tetons before heading south to Colorado, Idaho and Utah. I had some friends in Colorado to visit, but mostly wanted to be open to detours and what I might discover along the way. It didn’t take long for me to run into what would turn out to be my biggest nemesis on the trip. Driving out the Columbia River Gorge, an area known for its scenery, waterfalls and a top wind surfing destination, I was cruising along on Interstate 84 when a gust of wind suddenly and without warning shoved me—at 65 MPH–sideways out into the left-hand lane. Lucky for me, there was no traffic in that lane, and I was able to right myself pretty quickly. But not before my heart rate exploded and my knees started to wobble. Of everything I feared before heading out—breaking down, getting lost, brakes giving out, unsavory characters—being tossed about like a ping pong ball on a windy beach was not one of them. That was my first lesson. To slow down. And that I could worry about any number of things, but likely many of them would not come true. The wind and I constantly battled. For six weeks, I had some blissful wind-free days, but my route through Washington, Montana, Wyoming, Colorado and Eastern Oregon tested my nerves. I got a little better at driving in the wind, mainly by slowing down and avoiding the high-speed highways when I could. I cut my driving down, trying not to do more than 2-3 hours/day and to spend more time exploring those small-town cafes and hiking to hot springs. I got lonely from time to time, but then ended up at the door of a 30+ year friend who welcomed me with healthy food, long talks and scenic drives. me to pull over for the night. 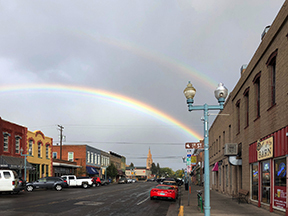 Right after I found the memorial bench and said a silent prayer for peace, I was blessed to see a double rainbow over the town. 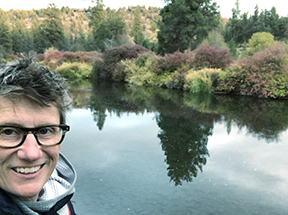 My heart is full from unexpected moments, like meeting a street performer in Hamilton, Montana, randomly running into an old friend in Missoula, climbing down a steep embankment to a hidden hot spring and catching sight of herd of Rocky Mountain sheep right across the river from my campground. 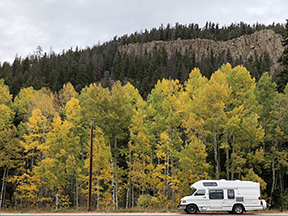 I discovered the beautiful community of Pagosa Springs, took pleasure in preparing simple meals on my tiny cookstove and got into a simple daily routine. Mostly I’m proud that I headed out, despite my fears, on my own, to seek and ultimately find my own adventures. Before I left home, I heard from so many others who talked about this being their dream too. But each one had an excuse why she couldn’t do it. Money. Time off work. Responsibilities. But I wonder how many are really just reluctant to face their fears to see what might be on the other side? Kathy Belge has been a freelance writer and journalist since 2003. With a magazine journalism degree from Syracuse University, she writes about travel, culture, politics, trends and the LGBT community. She is co-author of Lipstick & Dipstick’s Essential Guide to Lesbian Relationships and Queer: The Ultimate LGBT Guide for Teens. In addition to writing books and magazine articles, Kathy has a number of business clients for whom she writes website content, guest blogs, staff biographies, informational articles and all means of SEO friendly articles. Follow along with Kathy’s adventures on instagram at #travelswithsqueaky2018 or visit www.KathyBelge.com. Lovely article Kathy! I love how you are willing to make yourself vulnerable while also describing your adventure.